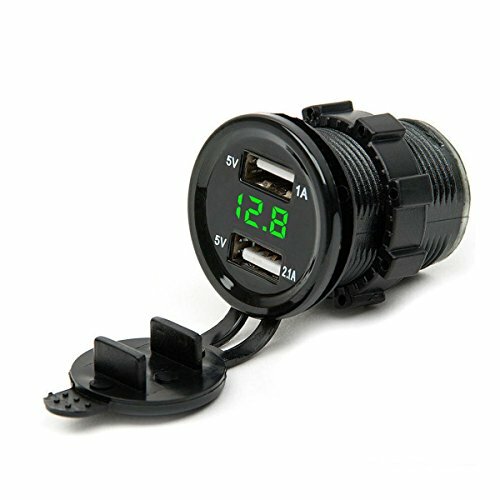 1.12V/24 Dual USB Voltmeter Car Cigarette Lighter Charger,is a multifunctional product, perfect for travel use. 2.Waterproof and dustproof material can be used for the interior and exterior application. 3.Two USB ports charger, support smart IC charging, Max 5V / 4.2A output, can charge for two devices at the same time. 4.Widely used with electric equipment for power supply:GPS, mobile phone, tablet, camera, mp3. 5.Easy to install, no need to cut out a big hole in the pane. 6.Support to install in 12-24V motorbike, boat, riding mower, truck, tractor or car. 7.With 3 colors(Red/Blue/Green) LED voltage display. 1.Do not connect the Socket to a power over 24V. 2.Check maximum voltage on devices to charged in advance. 3.Always cover outlets when not in use to avoid dust and water entering. 1 x Car Cigarette lighter Charger. 【LED Digital Voltage Display】 The cigarette lighter socket is built in LED indicator, dispalys the real-time accurate voltage status of your vehicle's battery for preventing problems caused by low voltage, the red light also makes quick and easy to find USB ports in the dark or at night. 【Easy to Use】 Easy to install, convenient for daily use. 【 Broad Compalitity】This charger socket fits for 12-24V car, boat, marine, motorcycle, ATV, RV etc. Suitable for charging mobile phone, GPS, digital camera, PDA and other USB accessories, backward-compatible with QC 2.0 &1.0. 【What You Get】One highly quality Car Cigarette lighter Charger with professional distribution management, intelligent distribution, more current, Save charging time more than 30%; safe, fast. The output current is 2.1A and 1A. If you have any questions about this product by Leyeet, contact us by completing and submitting the form below. If you are looking for a specif part number, please include it with your message.